I was lucky enough to spend quite a bit of time in Scotland last month, mostly in the capital city Edinburgh. While there, I was comfortably bunking in a quiet residential neighborhood near the University of Edinburgh. 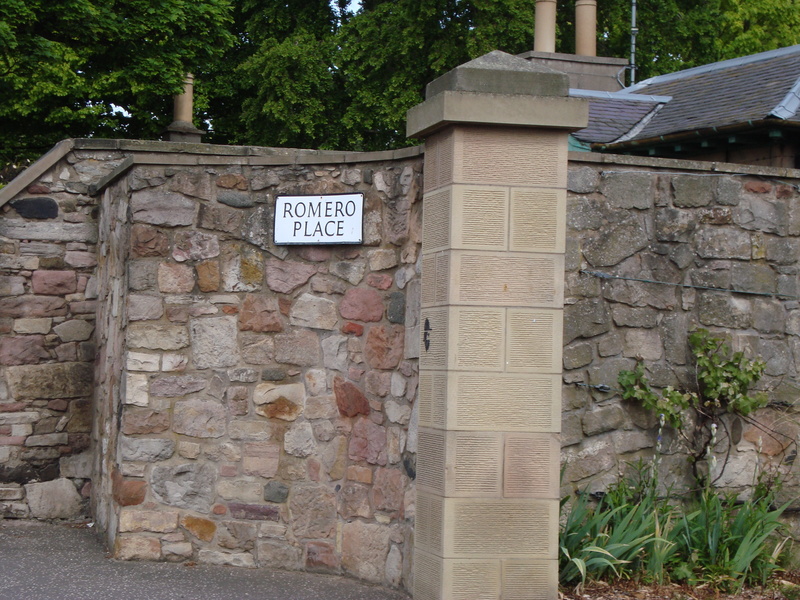 On more than one occasion, I made my way along Dalkeith Road, in order to reach Holyrood Park, a picturesque green space with towering hills and great views of the Royal Mile, the Scottish Parliament, and the Queen’s residence in Scotland. The University’s Pollock Halls of Residence are situated on Dalkeith, so I passed by them several times during my visit. But I must have been staring at my feet for the most part because I didn’t notice that one of the halls is named “Romero Place” until my last day in the city. Even then, my first thought was only that it was just a strange name for a place in Scotland. A British friend told me that a lot of Italians live in Edinburgh, so I figured the residence hall must be named after some generous Italian immigrant who perhaps attended the university or served in its community in some capacity. But then I noticed a relief sculpture embedded in the stone wall near the name plate. Campesinos collecting culture from a tree that appears to be rooted in the body of a man? Very odd. Then I noticed the inscription surrounding the image. Que mi sangre sea semilla de libertad y la señal de que la esperanza será pronto una realidad. Let my blood be a seed of freedom and a sign that hope will soon be a reality. The quote is from the Salvadoran martyr Óscar Romero. And I immediately felt like an idiot when I realized that the residence hall was named after this great defender of human rights. How had I missed this when I had passed by the building so many times before? Archbishop Romero’s story is an interesting one. He grew up in a relatively poor family but didn’t take to his father’s wishes for him of becoming a carpenter. He entered the priesthood instead, and actually spent the early years of his career not as the social justice stalwart we remember Romero as today, but as a believer in church hierarchy and the separation of religion and politics. While he was climbing the ecclesiastical ladder, he was considered a conservative and far from a friend to devotees of Liberation Theology. There was actually a great deal of consternation among the political left when Romero was named Archbishop of San Salvador. But Romero had greatly reconsidered his politics and philosophy before taking on that important place in the Salvadoran church’s hierarchy. He had witnessed first hand the neglect of poor while serving in his previous position as Bishop of Santiago de María, and he had become conscious of the ruthless slaughter of individuals who stood in the way of power. Now in a position of authority to speak out against such atrocities, he did so and became a marked man. Ultimately, Romero was gunned down by the Salvadoran right wing on March 24, 1980, while he was in the midst of performing a mass at a hospital. With the saintly leader now gone, all hell broke out in El Salvador, and the country fell into a twelve-year-long civil war. Romero’s work for the political freedoms and human rights in El Salvador has since become immortalized in the arts. A sculpture of his likeness fills a prominent place in the Gallery of Martyrs at Westminster Abbey in London. Songs and poems have been written about him. And Raúl Juliá even portrayed the Archbishop in the 1989 film Romero. But I’m still trying to figure out why this particular residence hall in Edinburgh bears his name. Is there a special connection with the university? or the city? All I know is that I wish I had lived in a dorm named after a human rights champion when I was a freshman in college.